Bowling first in the opening match on Sunday, CSK found it extremely easy to stem the flow of runs despite an 82-run innings from the returning Chris Lynn. As wickets fell at regular intervals, CSK completely thwarted the innings played by Lynn with false innings from the KKR middle-order seeing them get starts but failing to convert them into meaningful scores to propel the target above 180. For the visiting side, it was Tahir who ended his spell with figures of 4-27 that turned the match his side’s way. Despite Jadeja going for 49 runs from his quota of overs with Lynn going after him, hitting him for 3 consecutive sixes in an over, KKR failed to play out CSK’s biggest spinning threat intelligently. Nitish (21), Robin (0), Russell (10) and Lynn (82) all fell to him and in an innings where Shardul returns with figures of 2-14, the batting performance paints its own picture. Stepping out to chase, the going wasn’t a smooth one for CSK either. Watson’s travesties against pace continued with Gurney trapping him plumb in front of the wicket for just the 6 runs and as the set Faf du Plessis departed for 24 runs within the powerplay overs, CSK’s innings started falling apart. 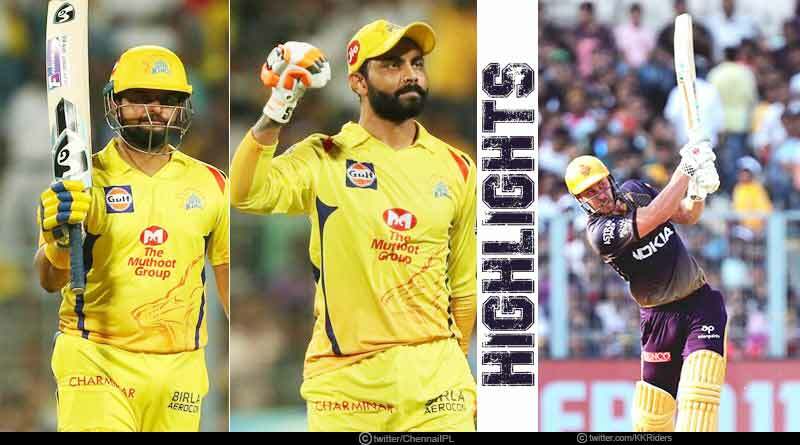 The wickets of Rayadu (5), Kedar (20) and Dhoni (16) tumbled soon after and while Raina went onto score his half-century, the ever-increasing run-rate meant the death overs were looking to be an extremely tepid ask for CSK. As the run-rate kept shooting up, the prospect of a win looked difficult to traverse until Jadeja stepped out to the middle to wrap up the match for his side with an innings that was long pending from him. For more articles like ‘KKR Vs CSK match review’, do follow us on Facebook, Twitter, and Instagram.